Pepperwood Preserve's Ryan Ferrell, left, and Tosha Comendant, center, with SSU's Claudia Luke survey the vista atop of the highest peaks of the 3,200-acre preserve. To the left is the structure that will hold one of the two Pepperwood fire-alert network cameras that will soon go online. As Claudia Luke and her hiking party rose above the oak trees to a clearing just below the ridgeline of Sonoma Mountain a funnel of dark smoke came into view far to the southwest toward Point Reyes. Given the purpose of the outing, the timing was extraordinary. “That’s amazing,” said Luke, director of the Center for Environmental Inquiry at Sonoma State, pointing toward the slim column of smoke rising behind a panoramic view of the Santa Rosa Plain. Given the devastating fires of October 2017, it’s the kind of scene that would strike fear in the heart of any North Bay resident. “But here’s the thing,” said Luke. “In just a few weeks we won’t have to climb all the way up here to see that smoke. We will be able to see it and zoom in on it from my office.” Better still, so will fire crews. In fact, the smoke will be visible from just about any home or office by logging onto alertwildfire.org, a website operated by the University of Nevada, Reno Seismological Laboratory in partnership with a number of universities and government agencies. The site features scenes from high-definition cameras sprinkled around California, primarily near Lake Tahoe and high-risk parts of the San Diego area. Seventeen cameras are now being added to that network in the North Bay, a part of the state that has suddenly become synonymous with devastating wildfires. 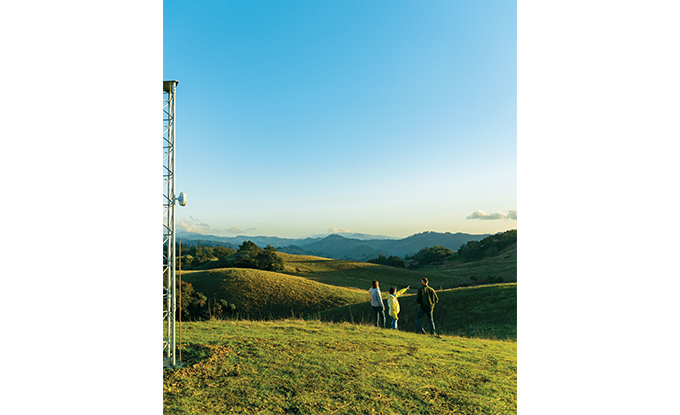 Two of these high-definition, near-infrared cameras will soon be installed atop the university’s 450-acre Fairfield Osborn Preserve, located on the northwest flank of Sonoma Mountain, where the cameras will command an expansive view of the region, from Petaluma to Santa Rosa and from Valley of the Moon to Mt. St. Helena. With the equipment’s pan-tilt-zoom features, fire officials will be able to zoom in on plumes like this one in the distance – and get a reading on its direction, Luke said. Having multiple cameras will then allow fire crews to triangulate the readings and get an exact location on the source of the smoke. 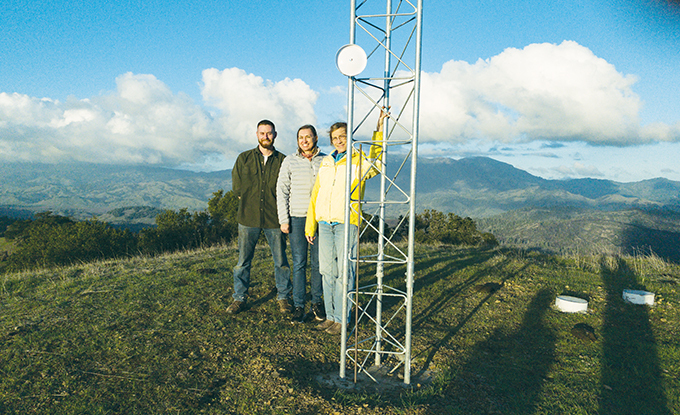 The network will start with 17 cameras on eight towers atop ridges throughout the North Bay. Two, for example, have been installed in nearby Pepperwood Preserve. But officials hope to eventually have as many as 28 camera towers as part of the ALERT-NorthBay Network, covering Sonoma, Napa, Marin, Mendocino and Lake counties. From here, the cameras will serve two critical functions, Luke said. First they will be the southern-most eyes of the eight-tower fire alert camera-system that will span, at least at the outset, from the Lake Sonoma Watershed to southern Sonoma County. Moreover, the SSU tower will serve as the lynchpin for feeding the data from the fire alert network into the CENIC network, a high-speed internet microwave system shared by colleges and universities. This will allow the information to be quickly and easily shared with researchers at UC San Diego, Cal Fire and elsewhere. And much more. “One of the additional benefits of this network, which is going to be so important for Sonoma State, is the way that it can boost the educational opportunities for our students,” said Luke. In addition to streaming data from the towers, the University will be able to transmit information collected from other sensors in the preserve – everything from microphones, seismographic sensors to microclimate sensors. The result is that “we are going to be able to bring our SSU preserves into classrooms on campus,” said Luke. But fire protection is the primary purpose for the cameras – and the most urgent need. This was driven home once again by the fires in Butte County in November, which claimed 85 lives and destroyed some 14,000 homes including the entire community of Paradise. The Camp Fire now ranks as the deadliest and most devastating fire in California history. The majority of climatologists and fire science experts agree that the public needs to be prepared for more of these kinds of devastating events in the future. Shortly after Driscoll’s testimony, the Board of Supervisors unanimously approved the $475,000 initial funding for the pilot project. “We cannot get those cameras up fast enough, as far as I’m concerned,” said Supervisor Shirlee Zane. Sonoma County is known for many things: oak-studded hills, agriculture and a majestic coast line to name but a few. But since October 2017, the region has also become synonymous with one other natural element: wildfire. During the 50-year span from 1964 to 2015, Sonoma County experienced 18 major wildfires that destroyed nearly 2,286 structures. The biggest of these was the 1964 Hanley Fire. But even that historic blaze was nothing compared to the ferocity and swiftness of the Tubbs, Nuns and Pocket fires that swept through the region beginning on Oct. 8, 2017, fueled by winds up to 80 mph. By the time the fires were contained weeks later, 44 lives had been lost, more than 7,000 structures, including 5,334 homes in Sonoma County alone, were destroyed and more than 110,000 acres of land had been burned. If there was a common theme to the many stories of those who were forced to flee or fight through the heat and smoke to save lives, it was this: chaos. Everything happened so quickly, no one could get a handle on how best to allocate resources to either fight the flames or to evacuate homes. Experts say what would have helped would have been to have eyes in the sky showing them what was happening. “Cameras during the 2017 firestorm would have enabled a quick determination of the number and size (of the fires) and their locations,” said Graham Kent, director of the Nevada Seismological Laboratory at University of Nevada, Reno and overall manager of the camera network. “The speed of the fires would have been recognized early on. The public could have also watched it all unfold on the AlertWildfire website, providing more public situational awareness.” The result is that early identification “might have led to a victory or two” in stopping some fires early, he said. As an example of the system’s efficiency, Driscoll said that thanks to the assistance of San Diego Gas and Electric in setting up 15 cameras in a fire-prone region of San Diego, firefighters there were able to swiftly respond to the Lilac Fire that erupted in northern San Diego County on a red flag warning day in December 2017. How long after ignition did it take for firefighters to spot the fire and begin their response? Thirty-one seconds, according to Driscoll. Although the fire still burned 157 structures, no lives were lost – and the blaze was contained to 4,100 acres. In terms of battling the kind of the firestorms that are becoming all too common in California, that is what a victory looks like.